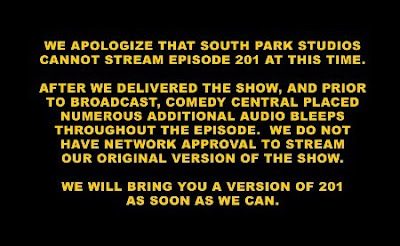 In the 14 years we've been doing South Park we have never done a show that we couldn't stand behind. We delivered our version of the show to Comedy Central and they made a determination to alter the episode. It wasn't some meta-joke on our part. Comedy Central added the bleeps. In fact, Kyle's customary final speech was about intimidation and fear. It didn't mention Muhammad at all but it got bleeped too. Cowardly Channel full of gutless liberals(birm). You Mean Like the 'Unity' You Showed Bush? So World War IV Is Over Now?